Larry Groff interviews Susan Jane Walp for the Jerusalem Studio School blog. Groff: When you spoke of turning to still life to "feel the ground under my feet", are you talking about the intense concentration found in observation based painting which can induce a meditative state of mind or "being in the moment"? Walp: Yes, I think you are so right—that the concentration of working from observation can be similar to a meditation practice. 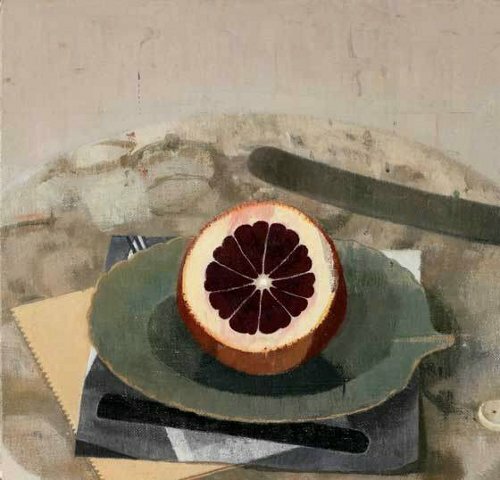 And perhaps with still life even more so than working from the figure or landscape, because the distractions are reduced to a minimum, the objects are still, can't engage you in conversation, don't need to take breaks, aren't subject to changing weather. Groff: This level of concentration can temporarily quiet the chatter from other artists' voices and allows for your authentic voice to be heard. I love your statement that is quoted in the Maureen Mullarkey essay, "Still life asks for a kind of humility and I like that about it—working from a place where the usual demands of the ego are not so helpful and can be temporarily ignored." Ms. Walp sounds like a kindred spirit. Groff: I read that you started to study Indian drumming several years ago and you talked about how improvisation within a rigid structure gave you a "parallel discipline" and how you loved the energy that being a beginner brought to the studio. What is the beginner's energy you refer to here? Can you speak more about how working within a rigid structure can allow you greater freedom? Walp: I think when you are a beginner everything is still possible, nothing is solidified into habit, and progress is very tangible and gratifying. When you've stayed with a particular discipline for so many years, as I have done with painting, there are many plateaus, many swamps and bogs, and a parallel discipline where one can engage that beginner's energy again can be very helpful—at least this has been the case for me. There have been a number of them for me—with my first husband I was a serious student of Go, a three-thousand-year-old Chinese board game, now played mostly in Japan. We learned from these ancient Japanese men in Denver and later went to Japan where we played in the commercial Go parlors in Tokyo every day for nearly three months. Here in Vermont I first rode horses and then was a student of Aikido for several years and then found my way to Indian drumming. It proved too demanding! I never become particularly proficient in any of these. I was serious and worked at them and could take things to a certain point and that was it. Sometimes it feels as if I am married to painting—it is basically a good marriage and these other activities are like temporary "affairs" that eventually bring me back to my main love. It is true that I am attracted temperamentally to things that require a kind of discipline and have built-in limitations. I think this is because basically I am a somewhat lazy person who is easily distracted and also overly impressionable. Walp will be the Master Class Guest of Honor at the Jerusalem Studio School's program in Civita, Italy this summer. Sigh. Yes, a kindred spirit, I suppose, and I like the still life, but it always makes me a little queasy when a discussion about art immediately turns away from the art and makes it secondary to something else. Life is more important than art, of course, but meditation is not, not to an artist anyway. They should stick to the work. And they do, of course. But if you've done a significant amount of meditation—by "significant," I mean enough to make you think you are literally going to die of boredom, and persist until the feeling passes—you'll recognize what she's talking about.